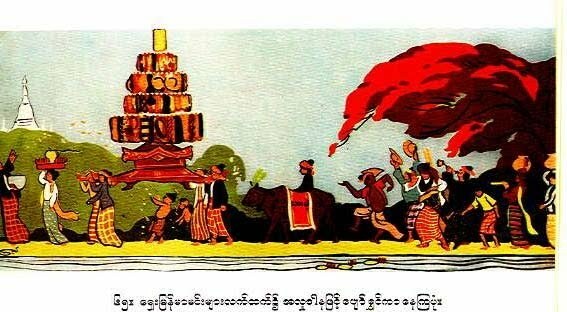 In the days of the Myanmar Kings, the rulers were just administrators and most of the ministers also dispensed justice well. Officers under their control were also prevented from doing any injustice or wrong. The people were law abiding and until not very long ago rains were regular, and even in dry zones agricultural land could be cultivated with success. Textiles, consumer goods and fancy goods were not imported into this country from foreign places in these days as at present. Consequently there was no drainage of the country's resources to foreign lands. Paddy, rice and oil were produced in profusion and there was more than enough for local consumption. Scarcity of thefts and robberies kept the people happy and contented. They celebrated pagoda festivals and other charitable functions, and used to go round with an artificial tree laden with native cakes, sweet meats and fruits, such as plantains and coconuts, in a carefree and joyous mood of charitable display.